Alphabet’s Waymo has picked an idled American Axle & Manufacturing Holdings facility in Detroit as the site where it will equip vehicles made by Fiat Chrysler Automobiles and Jaguar Land Rover Automotive with self-driving technology. The Mountain View, Calif.-based company will lease the factory and start work on its self-driving vehicles this summer, creating “hundreds” of jobs over time, according to company blog posts. American Axle started downsizing its industrial complex on the border of Detroit and Hamtramck in 2008 and shuttered it four years later. Waymo said it’s chosen a site that allows it to quickly start operating in the middle of this year, and that has a deep local talent pool of engineers and other automotive professionals. In a separate shop inside the assembly plant, workers install self-driving hardware for autonomous vehicles that are being tested by GM Cruise, the automaker’s San Francisco-based autonomous-vehicle unit. Tesla robotaxis 2020? 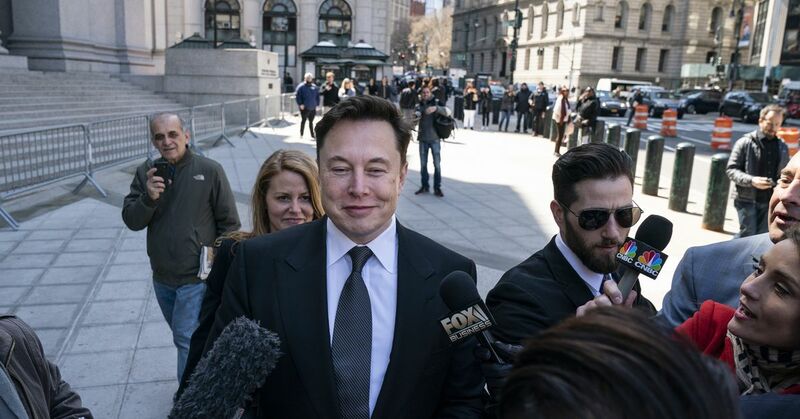 Be skeptical of Elon Musk’s latest prediction. Musk unveiled a new microchip that he claimed would be “objectively” the best in the world, predicted that fully autonomous Teslas capable of operating without a human driver would be on the road by mid-2020, and said the company would have a fleet of “robotaxis” out by next year as well. This isn’t the first time Musk has predicted that a fully autonomous car was on the one-year horizon for Tesla — the company made a pretty similar guarantee in October 2016 when Musk said Tesla would have a vehicle that could make a handsfree, self-driving trip from Los Angeles to New York by the end of 2017. Musk on Monday said that, given the potential for Tesla’s vehicles to be a moneymaker for customers who loan out their cars as taxis, it would be “financially insane” to buy anything else. Specifically, Musk gave guidance that Tesla will have a million "robotaxis" on the road next year, meaning a million truly driverless cars that can operate commercially in a ride-hailing network, generating passive income for their owners. But Musk went further to say that each Tesla -- equipped with some future version of its Autopilot and Full Self-Driving software -- could generate $30,000 in gross income for owners each year if operated as a robotaxi. In October 2016, Musk touted Tesla's second-generation autonomous driving hardware, saying that system could power full level 5 autonomy in his company's cars — that means the car could drive in all conditions with zero human attention. As of April 2019, Tesla has not demonstrated any of its vehicles completing such a trip, although self-driving pioneer Anthony Levandowski says a car from his new start-up accomplished the task last December. The commission urged parents who purchased the toy cars to immediately take them away from children. The 495,000 wooden toy vehicles were sold in an eight-pack assortment online and in stores from October 2018 to November 2018. They were $1 each or came as an $8 set with a caboose, Santa sleigh, ice cream/food truck, train, police car, fire truck, taxi and digger. The toy cars were manufactured by Zhejiang HuangyanXingbo Crafts Factory in China. Honda's Acura premium brand offers a new vehicle warranty that lasts four-years or 50,000 miles. Like Acura, Toyota's Lexus premium brand also offers a four-years or 50,000-miles new car warranty along with a six-years or 70,000-mile powertrain warranty. Audi's standard four-years or 50,000-mile new vehicle warranty is also supplemented by a 12-year unlimited mileage rust perforation warranty. BMW offers new car buyers a four-year or 50,000-mile new vehicle warranty along with a 12-year unlimited mileage rust perforation warranty. Along with other luxury brands, Porsche also offers a four-years or 50,000-mile warranty along with a 12-years, unlimited mileage corrosion perforation warranty. Ford's Lincoln luxury brand offers a four-year or 50,000 new vehicle warranty along with a six-year or 70,000-mile powertrain warranty. Hyundai's sister brand Kia offers a similar warranty package with a vehicle covered for five years and up to 60,000 miles. Discovered on 23 April 12:00 PM EDT. Elon Musk unveiled grand plans for Tesla's network of robo-taxis on Monday, with his sights set on a million autonomous electric vehicles shuttling passengers within a year. Tesla estimates the cost of running a robo-taxi on the "Tesla network," onto which any owner can add their car, to be less than $0.18 per mile. Using a sample fare of $1 per mile, that translates to $30,000 per car annually or $30 million when 1 million cars are running, as Musk predicts. Autonomy is key for ride-hailing, and not just for Tesla. Many Wall Street analysts have suggested that with self-driving cars, that expense could be minimized, giving both companies a gateway to profitability. CNBC's Jim Cramer went so far as to compare Musk to the famous showman and circus leader PT Barnum on air. Wall Street analysts were also underwhelmed. It wouldn't be much of a stretch to call this year's New York International Auto Show "electrifying," not when you consider that more than 40 vehicles using some form of electric power are on display at the Jacob Javits convention center. And it's coming up on a decade since the first plug-based models, the Chevrolet Volt plug-in hybrid, or PHEV, and the Nissan Leaf battery-electric vehicle, or BEV, hit showrooms. Named in honor of the world's first automobile using an internal combustion engine, the special version of the EQC will be the first all-electric model the automaker plans to sell in the U.S. But Daimler AG Board Member Britta Seeger said 10 BEVs will be in Mercedes showrooms by mid-decade and could soon account for 20-25% of the marque's total sales, most part of a new Mercedes-EQ sub-brand. Discovered on 23 April 11:00 AM EDT. Even if Musk and Tesla were able to convince every single future US car customer to buy one of the company's vehicles, it would take decades to create new manufacturing capacity, or convert existing capacity. Musk has never really been comfortable with the dynamics of the traditional auto industry, so he constantly seeks to keep Tesla on a separate plane, promoting it as a tech firm and a creation of Silicon Valley rather than a West Coast outpost of Detroit. Silicon Valley and Tesla are rightly pursuing self-driving tech because it should be safer. If I want a car, I can go and buy one for about $20,000 and drive it home in an afternoon. The upshot here is that it's OK to give Tesla and Musk the benefit of the doubt when it comes to the self-driving dream. Wamyo also said that it’ll work with a range of automotive partners — including Canadian company Magna — to outfit cars with its driverless system, and claims the retrofitted factory will be the world’s of its kind when it kicks off operations in mid-2019. According to a deal with the Michigan Economic Development Corporation (MEDC), Waymo’s manufacturing plant must be in operation by the end of 2021, with at least 100 new employees. Today’s news follows the expansion of Waymo’s full-service center in Chandler — which houses operations and support teams, including fleet technicians, fleet dispatch, fleet response, and rider support — last year to 60,000 square feet. More recently, the company said it would open an 85,000-square-foot technical service center in the city of Mesa, Arizona, near Phoenix’s East Valley, which it expects will “more than double” its capacity to maintain the fleet of cars in Waymo One, its driverless taxi service in Phoenix. Discovered on 23 April 10:00 AM EDT. The self-driving revolution and the prevalence of ride-hailing services such as Uber and Lyft threatens to reduce individual car ownership, which would eat into a sizable piece of automakers' core business. Meanwhile, tech companies are jockeying for a piece of the self-driving-car market, which Apple CEO Tim Cook dubbed "the mother of all AI projects." These companies are all looking to deploy self-driving cars as part of a commercial ride-hailing service that would operate similarly to how Uber and Lyft do now. In a new free report, Business Insider Intelligence— Business Insider's premium research service — takes an in-depth look at the most expansive self-driving-car tests taking place in the US, and offers insights on the leaders in the self-driving-car race.